They don’t mess around at Jerry’s Sandwiches. 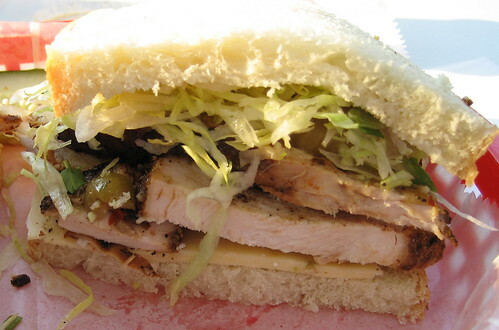 This is the blackened chicken with pepperjack cheese, giardiniera, and lettuce, on white. It was my own “create your own” sandwich. It’s great food. Stellar sandwiches. I ate this one outside at the 1045 W. Madison location. That’s West Loop, where the cool people hang out. But you don’t have to come all the way to the West Loop because they’re opening one in Wicker Park, where, if you can imagine, even cooler people hang out. There’s probably going to be one of those velvet rope lines and a bouncer out front. I can’t believe what’s happened to that street. I love blackened anything. They slice the chicken breast in huge, meaty slices and pile it on generously. It was good. The bread was fresh, the lettuce crispy, and the chicken juicy. Generally, I don’t do the “create your own” option. My theory is that the person who made the menu knows a heck of a lot more about making a sandwich than me, so I usually just order off the menu. But my love for blackened chicken with spicy cheeses and hot veggies overcame my better judgement. If I may say, my own concoction was very good and it wouldn’t surprise me if they put it on the menu permanently and call it the Chicken Fire Mouth Sammy. Posted in food on 2007/06/26 by John.